This soup is perfect for those days when you’re pressed for time and would love to have a delicious, piping hot meal waiting for you when you walk in the door at the end of your day. Aside from chopping the garlic and onions and measuring out your spices, all that’s required for getting this dinner started is opening a few cans! Just throw it all in and your slow cooker will do the work for you! You’ll walk in your front door to a house that smells totally divine and a nourishing dinner waiting for you. What’s not to love about that?! 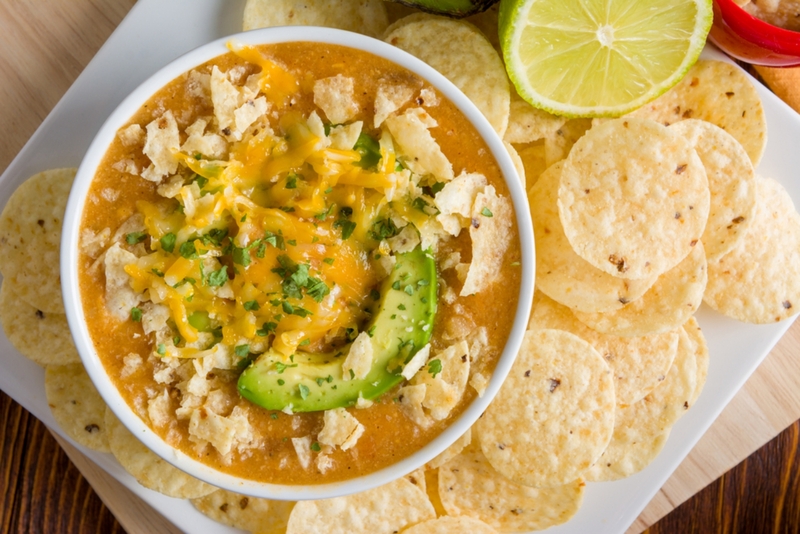 There are all sorts of tasty toppings you can add to this soup to take it over the top – we’re partial to the addicting combo of avocado, shredded cheese and Sriracha! Add all ingredients, except toppings, to the bowl of a slow cooker. Stir and cook for 3-4 hours on high heat or 6-8 hours on low heat. Ladle soup into bowls and garnish with toppings. Note: Soup will keep in the refrigerator for up to 5 days. You can freeze the soup in a freezer container for up to 2 months. If you want to add chicken to this recipe, use two chicken breasts. Shred chicken with two forks when it is done cooking.